Priyanka Gandhi is on a three-day boat ride on the Ganga as part of the Lok Sabha election campaign that will end on Wednesday in Varanasi, PM Modi's parliamentary constituency. 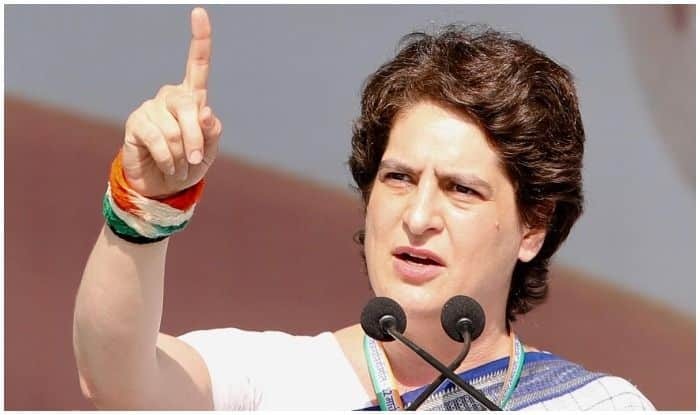 Mirzapur: Congress General Secretary Priyanka Gandhi Vadra on Tuesday said that people compared her looks with her grandmother Indira Gandhi as they still remember the late Prime Minister with respect for the work she had done for them. She also countered the Bharatiya Janata Party’s allegations about elections as a picnic for the Gandhi family, saying that she has not been to Italy in last three to four years. She also hit out at the Narendra Modi government for not fulfilling the promises it made to the people. During her river journey from Bhatoli ghat to Sindaura, Gandhi even switched to a smaller boat so that she could interact with the people residing near the Ganga’s banks. As the sun was setting, the people switched on the flashlight of their mobile phones and she went to meet them by taking her motorboat near the banks. Earlier in the day, pro-Modi slogans were raised by BJP supporters gathered outside the Vindhyavasini Devi Temple, eight kilometres from here, as she reached there. As Gandhi, who was clad in a red sari, got out of her car, hundreds of BJP workers started shouting the slogans and continued even as she entered the temple to pray. Most of the people in the crowd were regular worshippers, who were stopped from entering the temple due to her visit. Even shops and other establishments near the temple had to down their shutters. Gandhi, who spent some 20 minutes praying at the temple, however, remained unperturbed. As the sloganeering continued, she drove off to offer a chadar at the Kantit Sharief dargah near by where there was a huge crowd outside waiting to meet her. Most had arrived at 7 a.m., they claimed. Soon after ending the second day of her journey, Gandhi asked what the Modi government had done in the last five years. “Be it farmers, youth or anybody, no one is satisfied with the government. Together they will change the government this year,” she told the media in Bhadohi. “Now the BJP should tell the people what it did in the last five years. Shiksha mitras and Anganwadi workers did not get anything. The BJP had announced Rs 17,000 per month for them. The younger sibling of party chief Rahul Gandhi is on a three-day boat ride on the Ganga as part of the Lok Sabha election campaign that will end on Wednesday in Varanasi, Modi’s parliamentary constituency. Having set out from Prayagraj on Monday in a specially-built vessel with supporters, Priyanka Gandhi, who is the party’s in charge of eastern Uttar Pradesh, began the day after offering prayers at the Sita Samahit Sthal temple in Sitamarhi. She also held a meeting with party workers and leaders at the Sitamarhi guest house, where she had halted for the night on Monday. She also met several other delegations including that of the weaver community, Shiksha Mitra, and Anganwadi workers in the area.